I began my maths Inquiry this year wanting to find ways to strengthen and develop children's number knowledge and strategies to provide a good foundation for the development of future stages. Number identification was the main focus to begin with so that children could read, sequence, rote count, and record the numbers 1 to ten. For some students, language was a difficulty in developing "number sense" and I looked at ways to help these students with games, physical movement, concrete manipulatives, subitising and iPad activities. Once the students started to gain number identification we moved on to solving number problems using various strategies. Solving number problems provided lots of opportunities to talk. Group work with friends was important for some children to gain confidence at explaining their findings without the pressure of performing in a whole class situation. They talked about the strategies they used, compared answers and worked out who was more likely to be correct by sharing their findings all the while building up their essential skills and language needed for a good foundation. I hope to able to use the information I have gathered this year to give my next years learners a head start. I plan to use a maths wall from the beginning of the year to provide the children with the "verbal tools". By purposely exposing the children to mathematical language repeatedly and posing everyday maths problems I hope that the children will see how they too can use the strategies such as skip counting to solve problems. And they will see that numbers are not just used in maths time but are an important part of our lives. Being more aware of aspects that children found difficulties with such as sequencing, ordering and making sure objects to be counted are in an ordered pattern has made me more aware of thinking of and providing lots of different types of opportunities for learning. Data has been gathered by the formal JAM testing and has provided further information. There has been mixed acceleration in the priority group (as can be seen from the data) with some being significant by moving through the stages while for others even a minor change in a stage has still been significant for them. But the overall growth in confidence, the willingness to explain and give things a go, to use mathematical language and make connections show the children have made a good start in laying solid foundations for their maths learning. A quote from John Hattie about "the collective self perception that teachers in a given school make an educational difference to their student..." led into a discussion about what visible strategies did we leverage Learn, Create, Share to enable shift in our students. Team one began their discussion thinking we did not have as much accelerated shift as other areas in the school. We then started to think about where our students are at when they start school. Typically, they begin school with less language and knowledge than other 5 year olds and they have "to run to catch up". To achieve what they do in the first year means there is shift. To move from Stage 0 through to Stage 2/3 or even Stage 4 means they do achieve accelerated shift. 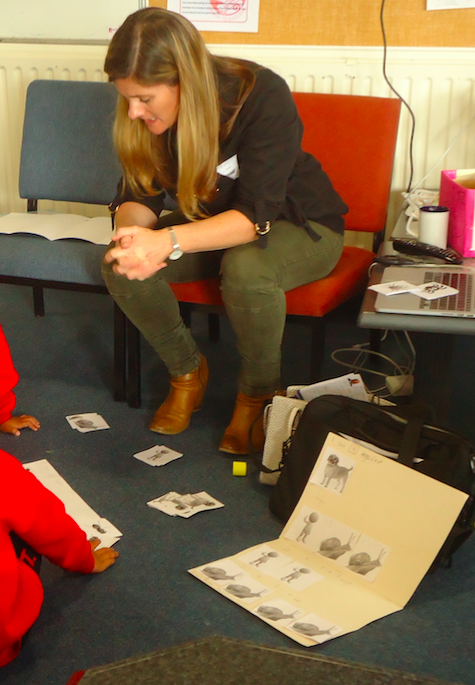 Ways in which this is achieved is through knowing your learner and how they learn, creating EE's with the learner in mind- using sound bites to make it easier for those that find reading a barrier, supporting the learner and repeating activities if necessary, using personal refections and planning accordingly. Visible evidence of how the learners are supported include sharing on airplay, peer to peer sharing, sharing with a group and sharing with the teacher. As language is gained, the confidence to share instead of a shrug become greater. The main data that shows evidence other than a child's EE that they have done is through JAM testing. A child at the beginning of the year would not participate in any of the discussions. He scored Stage 1 for number identification. By June he had accelerated to Stage 3 and by November he is at Stage 4. He has gained so much confidence that he readily joins in discussions being one of the first to put his hand up. This shift is huge when one thinks where they have come from over a period of 10 months. Maths PD with Jo Knox. After our previous Maths PD with Jo, Team One had asked to see a modelling session of rich addition and subtraction tasks to develop strong foundations to build on and to use to extend more able students. Jo often uses books to introduce the theme. This time she used a book with the intriguing title of "One is a snail, Ten is a Crab" By April Pulley Sayre and Jeff Sayre illustrated by Randy Cecil. It is a humorous and colourful way of looking at part-whole thinking. 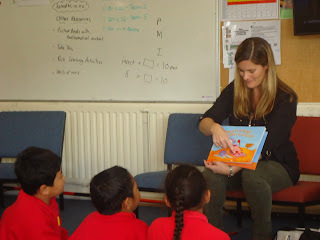 She talked us through the book and then introduced the book to a group of children who had not previously read the book. She also had pictures of these animals and people prepared to use after the reading. The children were able to see that the snail was the number 1 because it only had one foot. Two was a person, then they were asked what numeral a number 3 was. The children counted 3 feet so they quickly saw that a snail (1) plus a person (2) made 3. After introducing all the numbers up to 10, the book jumps up to the number 20. By the time Jo reached the page about 90 an immediate reply was given. Jo posed a question about 4 feet - what pictures could we use? A child responded with "A dog" and was given the task of writing the numeral 4 underneath it. Jo then draws out their thinking by asking could 4 feet look any different? She shows a person. The children discussed, counted, checked and gave reasons, and wrote the numerals with Jo adding the addition and equals symbols. By the end of the lesson the children have learnt how to make 6 in different ways. A group of older children also worked with Jo using the same book. We discussed ways in which we could extend the lesson for more able students to include skip counting and multiplication. 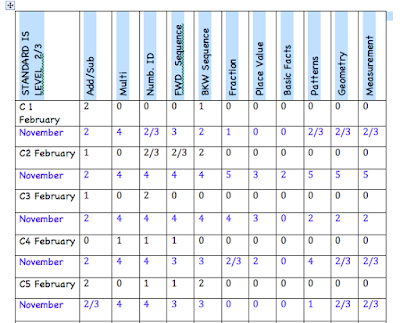 We also looked at the NZ Maths site to become familiar with their resources, and Jo suggested using other books to introduce and reinforce number concepts and strategies. "When Are We Doing Maths?" In a recent discussion at our team meeting we looked at the idea of making Maths fun and meaningful using problem solving. My Inquiry topic is maths based and the Geometry and Measurement topics we are doing this term lend themselves well to developing children's natural problem solving abilities. The children work in groups or with a buddy exploring a simple activity that can arise from a real life situation in the class or a structured activity to support the topic. They are able to use trial and error methods or a more structured mathematical way of solving the problem. All answers are accepted and evaluated to see which answers might be a better explanation. I hoped that this approach might also have a positive outcome of getting children talking more by being able to describe what they are doing and how they came to a conclusion. There is a lot more talk during our problem solving sessions. By being with friends they are more comfortable at attempting to put their thoughts together and take more risks in exploring other avenues. Finding the right words is often a problem for our children. The children are now learning to think about maths not just as "doing Maths" using the basic mathematical processes but as useful knowledge to use in a wide variety of different situations and to see the different areas of maths are all connected. For me it has meant that I need to think about the questions I ask. Do the children do most of the talking? How do I answer children's comments? How do I encourage describing, reasoning and getting children to explore the context further? How can I create opportunities for problem solving as well as using opportunities as they arise? The children appear to be engaged, they are willing to give the activities a go and they are involved. Labels: "When are we doing Maths?" Most of the children have developed an understanding of, and can discriminate between, the properties of number - ordinality, nominal aspects as well as cardinality. They can use this "information" about ordering things to find solutions. They have an understanding that the number line is a pictorial representation of ordering numbers. To do an addition it means increasing the number so they move to the right to increase the magnitude of the number. To answer the number sentence 3 + 2 = they can find the third number on the number line and make two jumps to the right to find the answer is 5. Similarly to do subtraction or to make something less by taking away means to move to the left or make numbers smaller. Subtraction has been the more difficult concept to teach as the children didn't see straight off that it was the reverse of addition. It was something I needed to teach them. They also find it more difficult to find a number before or to "count down". Some children are able to solve simple addition and subtraction without symbols. They can orally state what they are doing or they can use manipulatives. With practise they are beginning to rely less and less on manipulatives or fingers. They also have an understanding that a number can also be a label to distinguish an item. The bus is number 625 or a phone number is 579 3654. 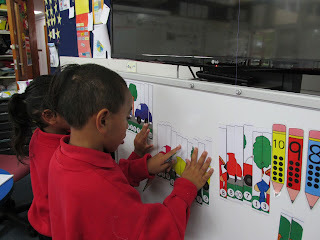 Counting a variety of objects into different sized sets has helped the children develop an understanding of cardinality. Counting the same sets several times starting from different objects has developed their understanding that the number in the set stays the same unless you add or take away some objects. A small number of children are still struggling with these three aspects. The number line being a visual representation and the corresponding mental representation to work out the magnitude of number remain a mystery. 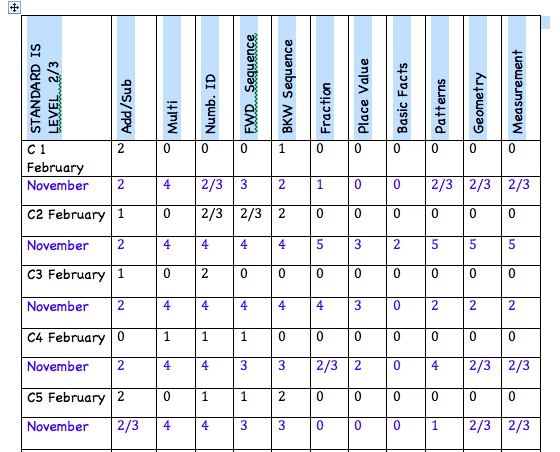 Difficulties with sequencing or ordering is not only with Maths. We continue to use a variety of examples with songs and chants to learn numbers, to use opportunities through out the day to count items and answer the question "How many? ", use guided as well as independent opportunities to practise of counting, use dice and dominos to look at groups, get students to verbalise their strategies and use visual representations. Monitoring their learning is still an important part of helping those with weaker skills. This does raise the question would some students benefit from intensive one on one help - a "Maths Recovery" series of lessons like the Reading Recovery programme? Our school wide Inquiry this year is focused on mathematics. Research results have shown we are achieving acceleration in reading and writing but it is time to turn our attention to maths to see if we can also achieve more acceleration in this area. 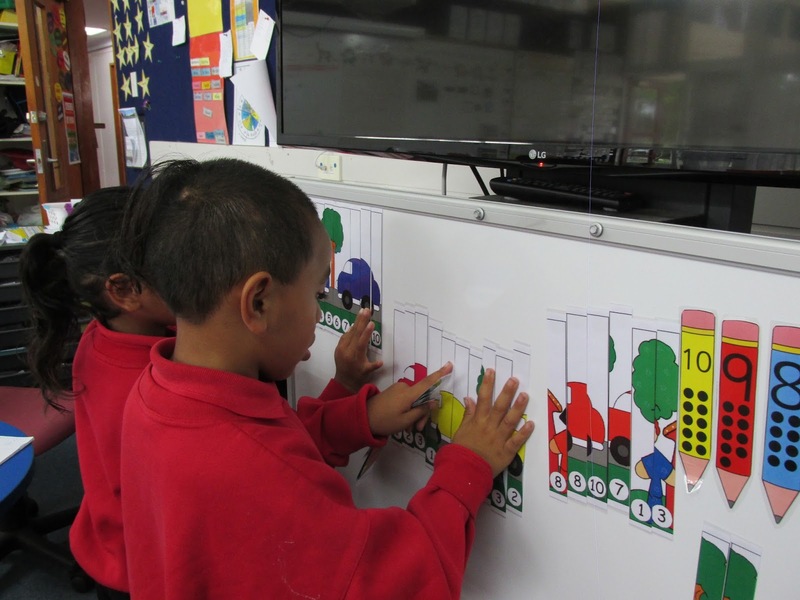 As I am a teacher of Year one children just beginning their mathematical journey it is important for the children to develop a sound number knowledge and strategies. My inquiry will centre on a group of children who find difficulty in moving from stage 1 (counting one to one) to stage 2 (combining sets - adding and subtracting). They can count and form sets of objects up to ten but they are unable to solve simple problems that involve joining and separating sets like 3 + 2. They can count the 3 counters in one hand and the two counters in the other but when asked how many they have all together they say "three two". This raises questions such as what strategies can I use to help these children? How can I strengthen these children's understanding? What key items of knowledge do the children need to developed? What learning activities can I select and implement that will aid these children? Would using manipulative equipment be more useful than iPad activities? 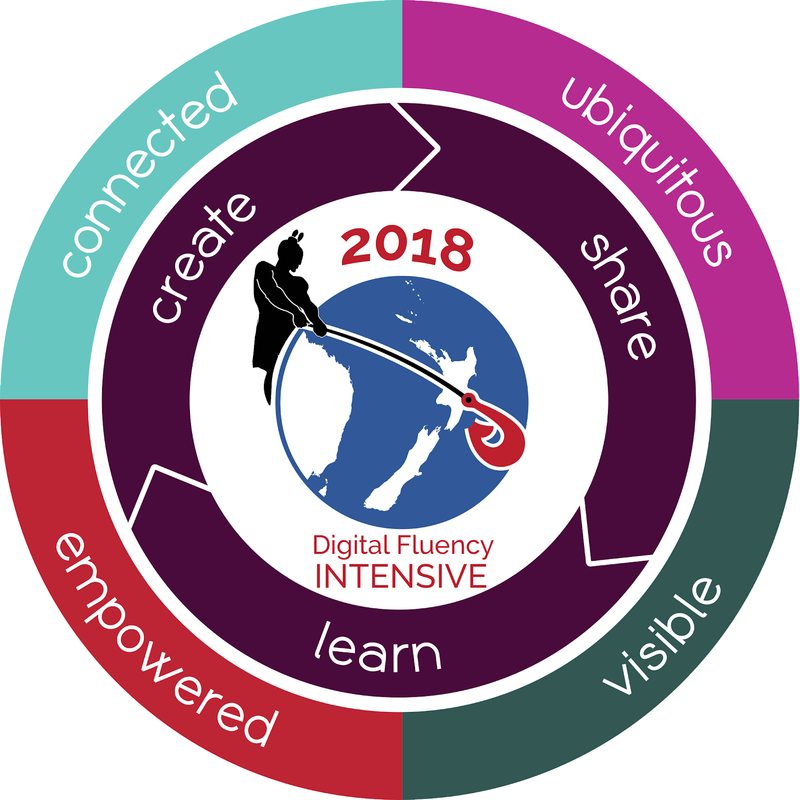 The beginning of this journey will involve an in depth look at reviewing their present knowledge to see what number knowledge they have and then working on activities to strengthen their understanding within the stage. This information, along with current literature and colleague's advice, will help me formulate an action plan for my teaching inquiry. New Beginnings in a New Year - 2017. It is the beginning of a new year with a group of 17 year one students. I am delighted to be teaching year one students again and to be taking the first steps in their learning voyage with them. The focus this year is that "we are voyagers." It is fitting to think about navigating through our learning journey. We need to know who we are, where we come from and where we are going to. Most of the children in Room 16 this year have previously spent a few weeks at school at the end of last year so they have a sense of belonging to Point England already. They are enthusiastic to get on with their learning voyage again. We have been getting into new routines and getting to know each other. We look forward to sharing some of our adventures through our class blog.